The Squid Sisters (Japanese: シオカラーズ Shiokarāzu, lit. Sea O' Colors) are a pop idol duo in Inkopolis, consisting of Callie and Marie (アオリ、ホタル Aori and Hotaru). Together, they host Inkopolis News; announcing events, updates, and the current stages in rotation. They also host Splatfest events, with each Sister representing one of the two teams. Despite their name, they are actually cousins, not sisters. For solo songs, see Callie and Marie. Callie's color scheme is magenta and black. She has an edgier design in comparison to her cousin, with angular eyes and perked-up ears. Her tentacles are long and black, tied in a large bow on the back of her head and fading to pink on the ends. She is very excitable and positive, often making innocent, straightforward comments with a grin on her face. Her solo song, Bomb Rush Blush, is a fast-paced and exuberant pop song, showing her energy and playfulness as she runs around the stage. Her favorite type of weapons are Rollers, and she has been seen to use a Hero Roller. Marie's color scheme is lime green and light gray. She has a more laid-back design in comparison to her cousin, with heavy-lidded eyes and slightly drooping ears. Her tentacles are long and light gray, tied in a large bow on the right side of her head and fading to green on the ends. She is less excitable, usually only giving a small smile. Many of her comments are sarcastic, though never outright intended to be mean-spirited. Her solo song, Tide Goes Out, is a slow, serene song, with movement kept mostly to her arms. Her favorite type of weapons are Chargers, and she has been seen to use a Hero Charger. Marie is the sassiest member of the pop idol duo known as the Squid Sisters in the Splatoon™ game. Along with Callie, she hosts Inkopolis News and Splatfest events, in which Inklings pick one of two sides and battle the opposing team in Turf War. These two cousins rose to fame after winning Calamari County’s first annual Youth Folk-Singing Contest, and their remarkable voices continue to rock Inkopolis! Inkopolis News is Inkopolis' news program, announcing events and updates on new features in Splatoon. Inkopolis News Studio can be found on the upper level of Inkopolis Plaza, where the Squid Sisters can be seen in their studio. Callie and Marie in different outfit colors for Splatfest. The Squid Sisters also hosted Splatfest events, a multiplayer event in which players of a region divided into opposing team, with Callie and Marie each representing a different team. Callie's team was always shown on the left side of the Splatfest artwork and Marie's team on the right. For the duration of the event, their clothes and tentacles temporarily changed color to match that of their team's ink and they performed a live concert in Inkopolis atop trucks outfitted with stage equipment. At the top-left corner of the box showing the player's Splatfest Power was a pair of eyes representing the Squid Sister they had sided with: players on Callie's team saw her angular eyes, and those on Marie's team saw her heavy-lidded eyes. Both versions had their signature pupils, but with a dark red color instead of the usual gold. During the results of the fifteenth North American Splatfest, Early Bird vs. Night Owl, Callie got sick of Marie's attitude, causing the duo to argue about who won more Splatfests before getting personal. This hinted at the announcement of the final Splatfest, Callie vs. Marie, which was confirmed to last 48 hours, as opposed to the usual 24-hour duration of a standard Splatfest. After the last Splatfest of Splatoon, the Squid Sisters grew in popularity, but Callie and Marie took separate paths for a time, leading to the events of Splatoon 2. The story of Callie and Marie's separation was told in Squid Sisters Stories, a series of stories made available on official Splatoon websites. The Squid Sisters reunite at the end of the Octo Canyon missions. Callie later mentions that they have performed alongside Off the Hook at least once. The Octo Expansion suggests that the Calamari Inkantation may have magical powers, as Marina claims that no Octoling can hear it and willingly continue to live in Octarian society. On 30 January 2016, a real-life Squid Sisters concert called "Shiokaraibu" (Japanese: シオカライブ, Squid Sisters Live) was held at Niconico Tokaigi 2016, a gaming event in Chiba, Japan. It starred digital projections of Callie and Marie, using unique, high-quality 3D models instead of those used in-game. They performed all five of their songs, most of them being extended or remixed slightly, ending with Calamari Inkantation. On 29 April 2016, the second live performance by the Squid Sisters was held at Cho-Ongakusai 2016, a music festival featuring a variety of popular artists that was held as part of Chokaigi 2016. The concert featured the debut of two new songs: Bomb Rush Blush and Tide Goes Out. They were solos sung by Callie and Marie, respectively. The following day, it was revealed that the new songs would be unlockable with the new Callie and Marie amiibo figures that launched that July. On 8 July 2016, their third live performance was held at Japan Expo 2016, a convention dedicated to Japanese pop culture in Paris, France. It had the same setlist as their second concert, with the dialogue in between songs shown in French. The live band's stage presence was also given more of an emphasis in this concert. A live album featuring recordings of the first two concerts, Splatoon Live in Makuhari, was released in Japan on 13 July 2016. A fourth live performance was held at Niconico Cho Party on 3 November 2016. A shorter performance, they performed a City of Color and Ink Me Up medley followed by Maritime Memory and Calamari Inkantation. On 10 February 2018, the Squid Sisters made a special appearance at "Haikaraibu" (Japanese: ハイカライブ, translating to "Inkopolis Live"), which was held at Tokaigi 2018. After Off the Hook performed Ebb & Flow, Callie and Marie went on stage to perform Fresh Start, followed by Spicy Calamari Inkantation. Afterwards, both the Squid Sisters and Off the Hook performed Now or Never! as the finale. An English version of the concert was held at Polymanga in Switzerland before the final rounds of the Splatoon European Championships on 31 March 2018. On 28 April 2018, another "Haikaraibu" concert was held at Cho-Ongakusai 2018. Their setlist was the same as the previous recent concerts, but their dialogue in between songs was different. Five of the concerts given by the Squid Sisters have been uploaded by Nintendo's Official YouTube accounts. Three of them were officially uploaded with English text. On 30 April 2016, SplatoonJP announced that Squid Sisters amiibo would be released on 7 July 2016. Using the Squid Sisters' amiibo applies all the cosmetic changes of a Splatfest to Inkopolis Plaza and the player can choose what song they perform. This is the only way to see the accompanying dances for these songs, with the exception of City of Color, the default for Splatfests. The Squid Sisters first appeared in issue 1 of the CoroCoro manga Splatoon, where they announced the CoroCoro Cup. They are hosts for that tournament. They now often appear in issues starting with issue 2. Callie and Marie's names together sound like the squid dish "Calamari", which is also Italian for "squid". The voice clips used for "Staaaay fresh!" sound like something in between "Shiokarāzu" and "sea o' colors", especially in Marie's case. Their names in Japanese, Aori and Hotaru, are derived from real-world species "Aori-ika" (Bigfin Reef Squid), and "Hotaru-ika" (Firefly Squid). In the Japanese version, they both have a bit of a Kansai dialect. Callie and Marie are presumably the second oldest Inklings in Splatoon (assuming they are the same age), with the oldest being Cap'n Cuttlefish. However, it is assumed that other adult Inklings do not participate in Turf War and are simply absent from the game. The art book for Splatoon 2 reveals that Pearl is also older than them. The horizontal marks on their outfits resemble the cuts made in squid when grilled. If the player stands outside the Squid Sisters' studio, they will notice them and wave, as pictured in the Gallery. The colors of the chairs Callie and Marie sit on in the studio reflect the ink colors of the player's last match, or the colors of the current Splatfest. The main color is the opponents' color, with arrows in the player's team color. The hand movement they do during their catchphrase, "Staaaay fresh! ", is supposed to resemble the moving tentacles of a squid. 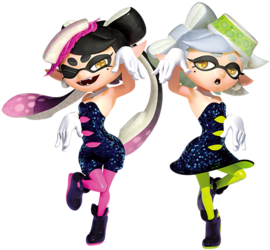 Several fans have noted that Callie and Marie resemble Bayonetta and Jeanne from the Bayonetta series. It is unknown if this was intentional. Before Splatoon was released, the Squid Sisters were not idols, but were instead planned to be "shrine maidens". They were meant to transmit divine messages from God to the Inklings. This is why they were in charge of receiving and announcing Splatfests in the first game. At some point shortly after the release of Splatoon, Callie's favorite weapon was the Charger and Marie's was the Roller. This was eventually switched later on. The Squid Sisters' grandfather, Cap'n Cuttlefish, has two small pictures of them taped up on the corner of his cabin, one of Callie and one of Marie. In Octo Valley, their backstory is shown in Sunken Scroll 17, which is also their age in Splatoon. Ika, yoroshiku! Squid, best regards! Dutch Houd het vers! Keep it fresh! French Á plus tard, calamars! See you later, squids! German Bleibt spritzig! Stay cool! Spanish ¡Nos vemos! See you! Ja, jal butaghae! Well, please take care! ↑ Referencing an article in Splatune. ↑ Korean forum post testing Animal Crossing: New Leaf amiibo compatibility. Posted by nokcha (2016-11-05). Retrieved on 2016 December 5. ↑ Apresentação Splatoon Direct - 07.05.15. NintendoPT (2015-07-05). Retrieved on 2016 March 13. This page has been accessed 336,484 times.